This post is sponsored by StriVectin. However, all opinions are my own. I didn’t have troublesome skin as a teen. Aside from a few hormonal pimples that disappeared within a few days. With no evidence left behind. My skin decided to act out when I reached my 30s. I would break out more often, usually in the form of a few cystic pimples. Hormonal breakouts. Breakouts from lack of sleep. Stress. The piece of chocolate I ate after lunch. If I blink too hard. Seriously, I felt like everything caused me to break out. I don’t get much cystic acne anymore. But now that I’m 35 I have different skincare concerns. Dullness and fine lines. That’s why I’m using StriVectin Advanced Acids skincare. The StriVectin Advanced Acids skincare collection pairs NIA-114 with skin-transforming acids to repair signs of aging, and reveal visibly younger looking skin. NIA-114 is scientifically proven to penetrate the skin’s deepest layers, intensifying the efficiency of other ingredients. 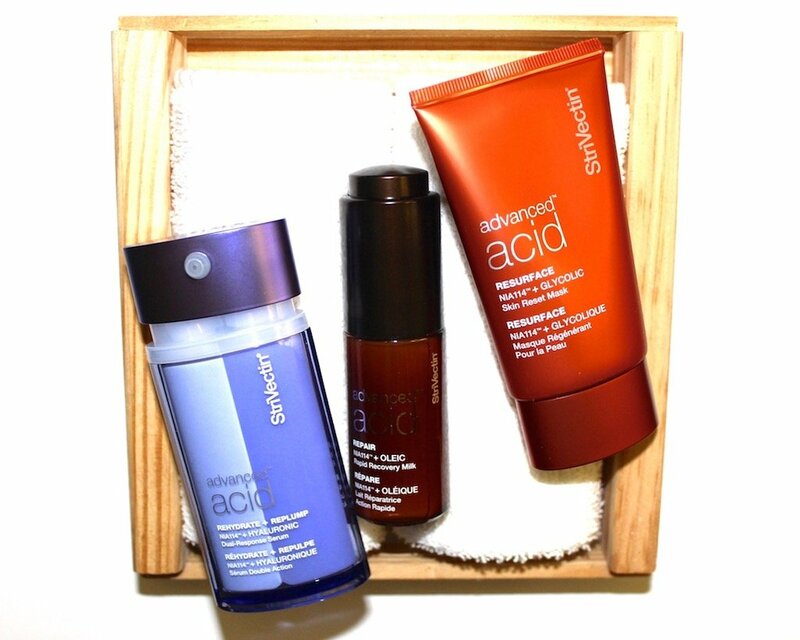 The Advanced Acids line consists of a resurfacing mask, hydrating serum and repair milk. 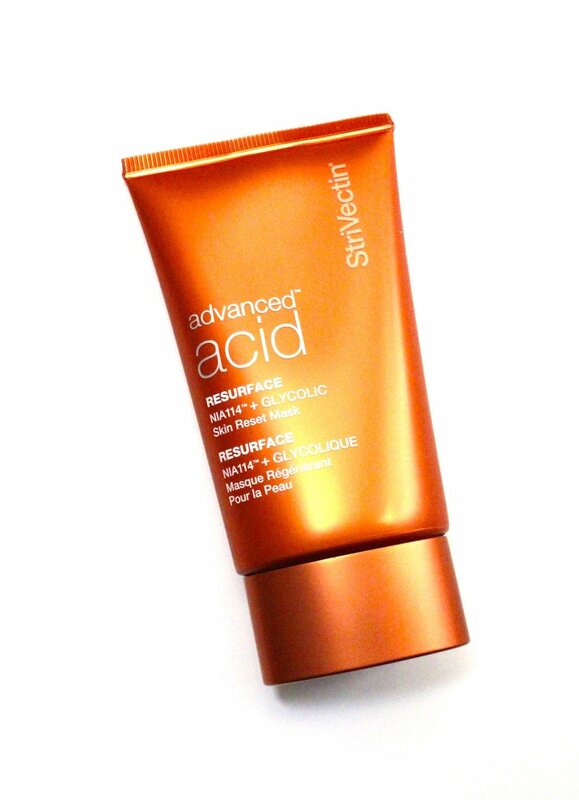 The StriVectin Advanced Acid Glycolic Skin Reset Mask gently exfoliates with micro-encapsulated Glycolic Acid to reveal fresh, renewed skin. 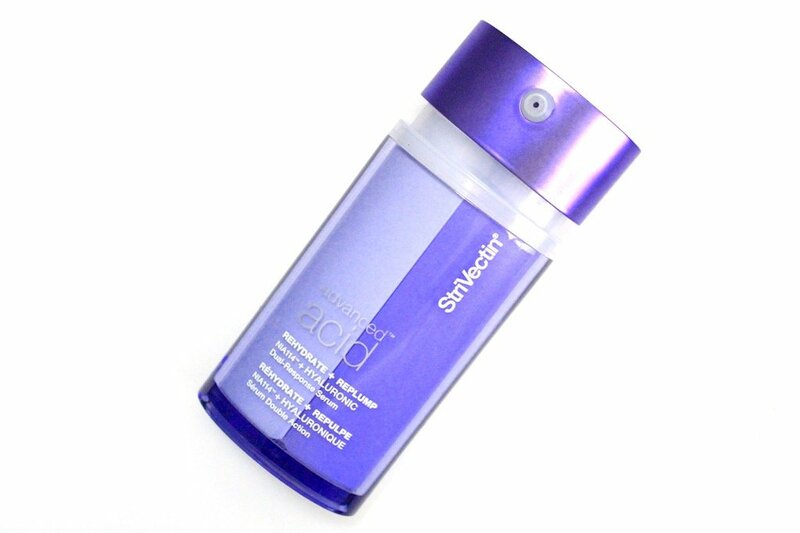 Glycolic Acid is the most effective Alpha Hydroxy Acid. Combined with NIA-114, the formula restores radiance and dramatically improves texture in just 5 minutes. I apply a thin layer and let it sit for the required amount of time. There’s a mild tingling sensation as with most AHA products. But no burning or discomfort. At the end of the session I simply rinse the mask off with water. I can’t get over how incredibly soft and smooth my skin feels after. Furthermore, the glow is amazing. I use the mask twice a week. 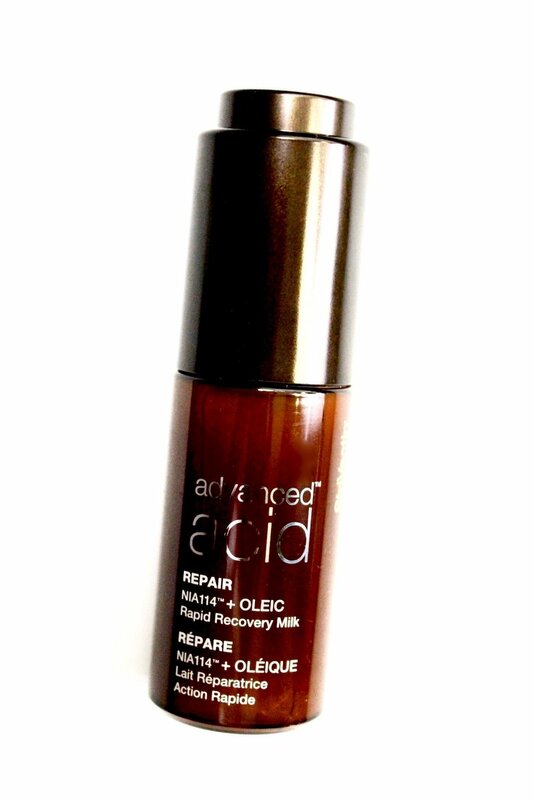 The Strivectin Advanced Acid Oleic Rapid Recovery Milk repairs and replenishes the skin’s lipid layer, while reducing the appearance of fine lines and wrinkles. NIA-114 + Oleic Acid, an Omega-9 fatty acid improves firmness and elasticity. The dropper makes it easy to dispense the perfect amount. The lightweight milk soothes dryness and restores the skin’s youthful appearance. My skin is left feeling soft & smooth, and looking plump. Also, the light cucumber scent is extremely calming. I apply the Rapid Recovery Milk after rinsing off the Glycolic Mask and toning with witch hazel. The Strivectin Advanced Acid Rehydrate + Replump Hyaluronic Dual Response Serum brings dehydrated skin back to life. Hyaluronic Acid can hold 1,000 times its weight in water. A combination of 6 types of Hyaluronic Acid and NIA-114 plumps skin with moisture and locks it in for visibly smooth skin. I apply the serum after the Rapid Recovery Milk and it glides on silky smooth and sinks right in. My skin feels supple, refreshed and extremely moisturized. I don’t even have to apply a moisturizer after. I can practically see the fine lines around my mouth disappear before my eyes. The serum is not oily so you can use it under your makeup. In fact I highly suggest this as your makeup will apply flawless. Just don’t forget the SPF. And primer if you’re an oily gal like me. 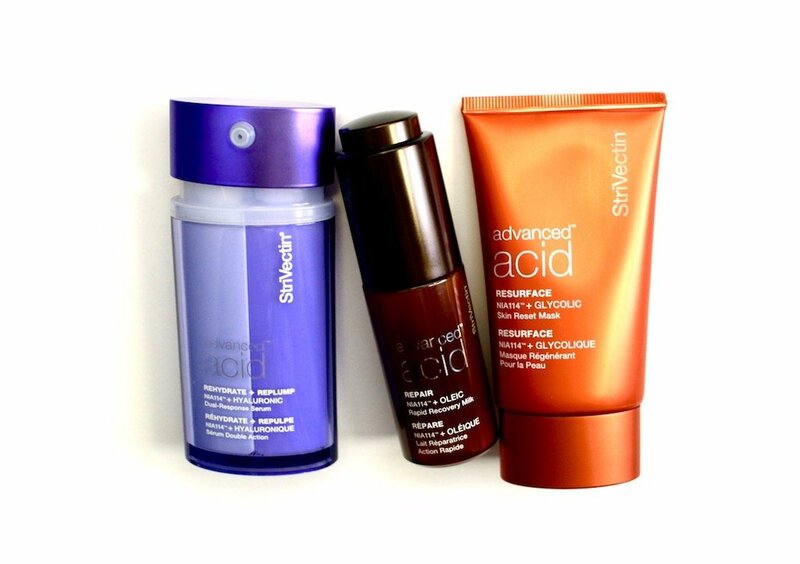 The Strivectin Advanced Acids skincare line is definitely helping to keep my skin in check. My skin is soft, smooth and glowing. The fine lines are fading. And I’m confident that there will be no wrinkles creeping up anytime soon. That’s what I call winning.